How difficult it is to resist temptation to buy a fringe item from a store, just to save $5? It’s hard, when you feel thirsty while you’re standing in front a cold soft drink. It’s hard to resist. For me particularly resisting a bar of snickers is too much. Well, the point is, you work too hard to save a few dollar. You deprive yourself to save such paltry amount. When it comes to asking for a raise, more than 70% of employees simply don’t ask for raise. They are afraid of making this simple request to their bosses. The best and smallest answer to getting raise is – ask you boss for a raise. When it comes to saving money we go all out and try everything we can, well, most of us. Then why not at the time of your performance review? Salary can only be increased to satisfactory level when you ask for it. Ask for a salary increase at the time of year-end appraisal, ask for a bigger pay check when you switch your job. Here’s my story in last 4 years. A story about my raises and how I got that salary increment. Almost half of work force is not happy at current work. still I don’t read news about workers protesting about their salary, except the minimum wage earners. Firstly, we are reluctant to discuss salary, even with our bosses. Secondly, we fear of getting sacked asking for it. When to know if you should ask for a raise? Here’s a good article. Whatever be your situation, there must be some way to work smarter and/or harder. Start doing it that way and then ask for a raise. No one can fire you if you do. Let your boss think you’re the best one around. I am not bragging about myself here. I hope by reading this article you get an idea and an inspiration to implement some of the methods I applied, and, get that well-deserved raise. Developed better rapport with my manager: No, I didn’t do whatever he said, but did most of it. If you have aim, if you are satisfied with your work, you can do most of it too. I took every chance to showcase my work to him. and I tried explaining to my best when I failed. Also, when I went against his direction, I had prepared many good reasons to explain to him. We went for many lunches together. We invited his family over for dinner at our place. Developed good working relationship with colleagues: Even if colleagues are your competitor when it comes to year-end appraisal or increment, but they are a very good medium for channeling your good self to your boss. If a few of them start praising your efforts in front of your boss, you are a winner. Improved my skills: In our office, we have access to many online tutorials and resources, which are available free of cost. If you have that too, do take advantage and learn something new, new skill, new practice, new way of doing old thing. When you feel like you do not have any enough work at office, turn towards taking a course. Enroll yourself to Toastmaster International. Develop your presentation skill, Toastmaster requires very nominal price, but return of investment is much higher. Tried to get attention in team meetings and group presentation: When your boss is not the only decision maker, he has to take opinion of his counterparts from other departments, presentations to those co-bosses go a long way. Do not lose a single chance to present to your superiors. I was very honest: You can not lie and sustain for long, you can not escape by exaggerating your achievements, you will be caught one day. I was very loyal, stayed at work for full-time, did my job dutifully, delivered all my projects on time and with quality. I asked for a raise: Only if you satisfy the above points you can ask for a raise. It is your duty, every workman’s duty. Do not hesitate, only letting out the first sentence is tough, once you started the conversation, it won’t be that difficult to convince your boss. If you are convinced yourself, why can’t you convince another person? I up trained new colleagues: A couple of new colleagues joined as few moved out to other departments. I took this opportunity to showcase my knowledge. I saved training dollars by arranging daily classes for a month. It was well-recognized in the company and I was featured in an internal story, on our website. Improved my skills further: I took up a few more training. I stepped up to fill the gap that was created after one bright resource left our team. It was not asked for but I volunteered and made sure of no project impact! I asked for a raise – Again: With the kind of achievements I had till mid year I approached my manager with a one pager listing all my work. During one-on-one meeting I asked for a raise. And I got immediate 5% increment. And during yer-end appraisal, my manager incremented my salary further. He knew I was going to ask for it anyway. it helps to have your boss on your side, right? 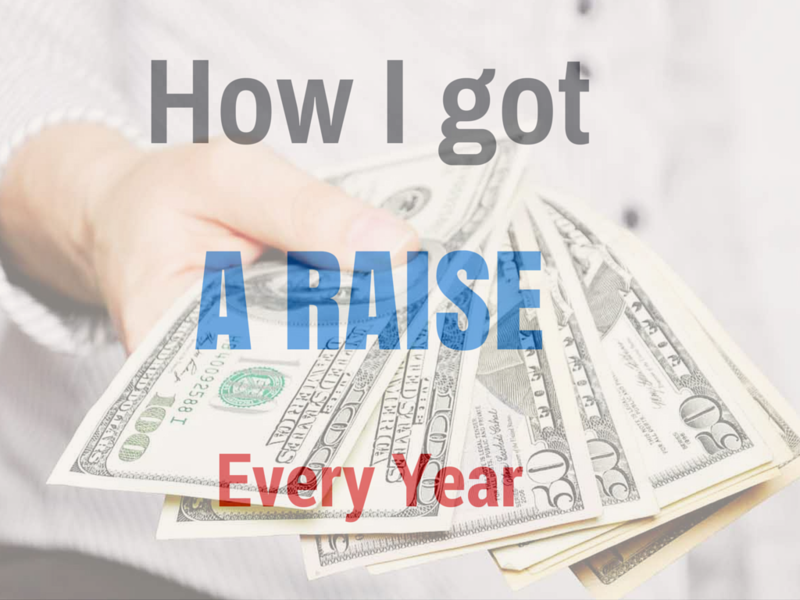 I got overall raise of 3.5% in 2014. Not much but I am not complaining. 2013 was not a good year for our department. had a few too many outages in production environment. Unfortunately I am not in production support to help out but we all took the hit. I asked for raise but turned away politely for valid reasons. I read this article, and tried to do everything possible, but nothing worked. Still I managed to secure a raise while other got 1 – 2% on average salary increment. Next year I am planning to jump across department to get more salary. It could be an internal move or moving out to a new employer. Over the year I have learned that in career, to go up, you need to be at right place at right time. Till you realize that, you need to move on. Unless there’s some other ties that hold you up. The bigger benefit of job hopping ( not too frequently though) is getting more and more salary with every move. And to be at right place at right time, you need to be always ready. Work hard, work honestly, work intelligently and ask for raise. Do leave your comments. Readers. are you inspired? Do let us know about your tips and plans. Big lover on this site, a lot of your blog posts have really helped me out. Awaiting up-dates! Thanks Hanny! Shall I offer you to be a guest author? Thats not just logic. Thats really snesilbe. Pretty superior post. We just discovered a website not to mention wanted towards declare who We have seriously enjoyed reading a website, not to mention discussions. Anyways I’ll turn out to be subscribing a give food not to mention I just desire towards study a website yet again. Hey there! Good post! But this website is loading rather slowly. This site has facebook fan page, a Twitter account and an iPhone ready app, do browse the site from your phone browser! Well this is my second most visited post. thanks for stopping by, did you subscribe to my feed yet? I enjoy you taking the time to write this publish. It has been really useful to me in fact. Appreciate it. You ought to actually take into consideration working on growing this blog into a serious authority in this market. You evidently have a grasp deal with of the matters everyone seems to be looking for on this web site anyways and you could possibly actually even earn a buck or two off of some ads. I’d discover following recent matters and elevating the amount of write ups you put up and I guarantee you’d start seeing some wonderful focused visitors within the close to future. Only a thought, good luck in whatever you do! Great post! I am actually getting ready to do more ezine marketing and coming across this information is very helpful my friend. Also great blog here with all of the valuable information you have. Keep up the good work you are doing here. Of course, what a magnificent site and illuminating posts, I definitely will bookmark your site.Have an awsome day! Greetings! I’ve been following your blog for a while now and finally got the bravery to go ahead and give you a shout out from Lubbock Tx! Just wanted to tell you keep up the fantastic job! Thank You! Will you want to be subscribed to my RSS feed? keep up the good work , I read few posts on this website and I conceive that your website is rattling interesting and contains circles of superb info . I tried to submit a comment earlier, although it has not shown up. How long do you spend writing your posts? I agree with your Ask for a raise, increase your salary, Earn More, good post. I’m going to ask my boss for a raise tomorrow! –>want to keep productive employees who add value to the company. So, no matter what the economy is like, when asking for a raise, you need to ALWAYS demonstrate your value to the company, and talk directly about that value. Like the article said, don’t worry about what others make; likewise, personal reasons for wanting more money are irrelevant. The only thing to focus on is the value you provide to the company. Maybe you’ve reduced costs, or increased revenue, or lowered employee turnover, or expanded a product line, or expanded sales into new markets. Whatever you’ve done, talk about it specifically. Think like a business owner. Ask yourself: if you were the owner, why should you pay this person (yourself) more? Now that you’ve laid out the reasons WHY you should be paid more, you can talk about HOW MUCH you think you should be paid. Some people think that whoever gives out the first negotiating number loses; I disagree. Instead, YOU should be the one to set the salary anchor (the “anchor” is the number around which the negotiation takes place), and make that number significantly more than your currently salary, but justified by your value to the company. Maybe a 40% increase is warranted, so ask for 50% (since it’ll likely be negotiated down). Whatever the number, say it matter-of-factly, and don’t blink. You’ve laid out your case and you know your value. Don’t be emotional. Practice your meeting with a friend or spouse. Back when I had a corporate job, I did this, and boosted my salary about 25%, when the typical salary increases at the company were 2%-4%. Yea, it is like pulling teeth from a bull. Great article. Something that a lot of people don;t think about it that if you work hard and you have a good relationship with your manager than you really don’t have much to lose. If you have a good boss they are going to try and help you out. You just need to ask. Hmm іt seems like your pay has really gone up. What is your position at current job? No not much. I am a lead architect come technical project manager. A dual role that I am playing here. Now this is some great tips for employees like. Salary increase is also a motivation for me to work hard. I was expecting an appraisal in my salary. It was my first time, I did not know how to prepare for the review meeting. After reading this blog, I got some essential pointers on how to prepare and negotiate my salary hike. Thanks a lot!